Well, for a short answer? Yes. Totally. This French-bred (not French Bread, as I’ve been informed) game created by Loic Lamy and beautifully illustrated by Melanie Fuentes creates a hilarious, tongue and cheek asymmetrical board game where teams of two have to show each other up and inform their partner about how well they’re doing… With out ever actually telling their team mate how they’re doing! Before we get into rules, I feel the need to explain what an Asymmetrical Board Game even is. While in a traditional board game, every one does the same thing, asymmetrical board games require one person to do a completely different thing from their partner, while simultaneously working towards the same goal. Imagine one player is driving up a steep hill while the other is taking a flight of stairs: Different ways, same goal! Now, one person plays the Wife and one person plays the Husband. The Wife spends her day helping the staff, shopping, and making sure that she has a full outfit together for the Ball that is coming up in three days. Meanwhile, the Husbands go to work at the stock market, making a living and supporting their wife’s lifestyle. Whoever has the most put-together dress for the Ball at the end of the game, and by proxy who made the most money, wins! Sounds simple? Well, it is until you realize that the Wife can’t tell her husband how much her outfit is, and the husband can’t let his wife know how much money he makes. It’s this part that makes me love this game: The lack of communication that is expected in a traditional relationship (“Men’s work is not a ladies business”, “Women shouldn’t trouble the menfolk with their silly things”) is implemented in a game where Gender Roles are burned down to their most basic principles and it’s hilarious. Now when you play as a Husband, you have to go to the Stock Market, which is really more of a puzzle-memory game combined with an auction game. Expect lot of bickering and picking up cardboard discs on this end. Women on the other hand have to use their staff, wits, and label knowledge to build an outfit to die for. It’s a bit of a card game with some clever decisions: Do you want to buy the cheaper dress that matches your brand, or the more expensive one to make sure the other Stepford Wives can’t have it. At the end of the day, the Wife presents her purchases to the husband, who will either make her return it (setting both of them back a good bit) or allow her to keep it. Mind you, you have to do this with OUT sharing how much the clothes cost or how much you made! While the game is designed for two teams of two (and, really, the game works best with an even number of players/spouses) they include a rather brilliant little variation called “The Courtesan” when you have an odd number of players. The Courtesan is “unmarried”, and can convince any Husband in game to buy things for her. If she has the best dress of the evening, she wins, and whoever bought her the most stuff, also wins! While a bit problematic in theme, it does add a nice little variation to game play. And that’s not even getting into the Gossip cards! Overall Ladies and Gentlemen is a clever, witty, and most of all fun little game, with lovely art and some really rather clever mechanics to back it up. Highly recommended! Skip A Turn Variation: Guys and Dolls: Play the whole game as 1920s Gangsters! Losers get a pair of cement shoes courtesy of Al Capone! This Post was posted in Board Game Reviews and tagged board games, Ladies and Gentlemen, review, traditional board game. Bookmark the permalink. Great summary of a great game. Although It is a bit tricky to figure out the first time you play, due to the asymmetry. True! Learning the game does take a good bit of time. This game sounds awesome, I want to play it! You give a very funny and thorough review of the game. It does seem like it would be tough to follow at first but I’m sure once everyone gets going it can be really interesting. 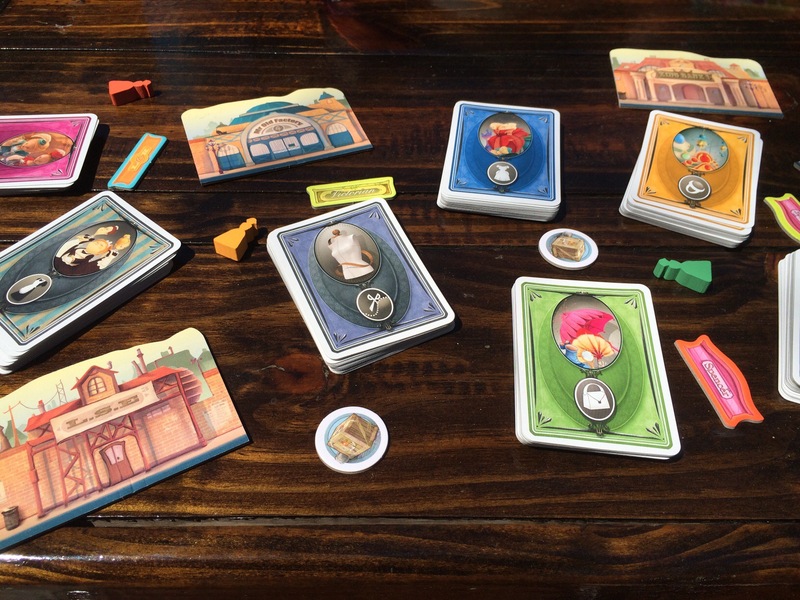 You also have included a really nice picture of the cards and pieces exemplifying how pretty the illustrations are.